Juul is sleek little brick that looks like a USB flash drive, puffs discreetly and smells like nothing at all. This year, cryptic signs for something called Juul began appearing in the windows of the 7-Eleven on my block. On vacation in Miami, where smoking is still allowed in many clubs, I noticed a pretty young woman pull a Juul from her purse and lay it on the bar, next to her cocktail. This summer, I saw Juuls at a Fourth of July crab crack and Juuls on the city bus. 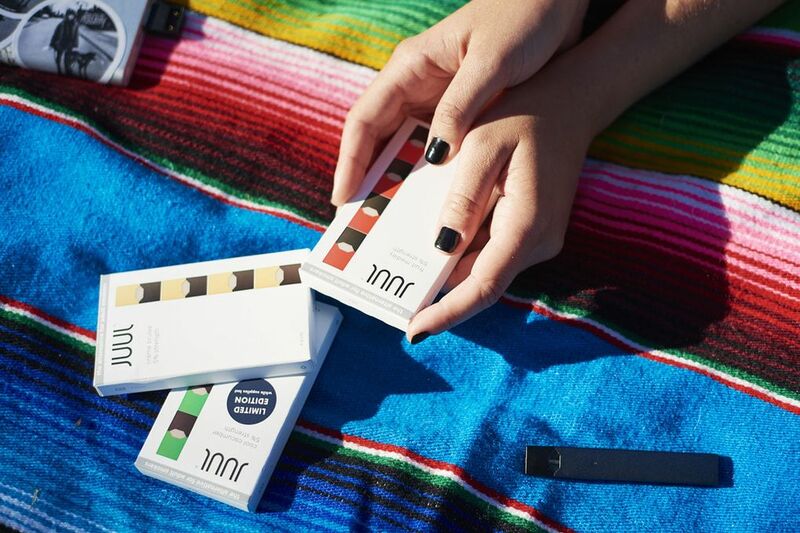 Juul, if you haven’t heard, has quietly become the most popular new way to smoke since the old coffin nail itself, claiming more than half of the booming market for electronic cigarettes. Where early e-cigs tended to mimic cigarettes — and hilariously generated more smoke than a fog machine — the Juul is as far removed from a cigarette as you can get. A sleek little brick that looks like a USB flash drive, it flickers with colored light, puffs discreetly and smells like nothing at all. It is the iPhone of smoking, and the kids are wild for it. So, I needed one. I bought Juul from a neighborhood head shop where the man behind the counter informed me that he sells so many of the things he can’t keep count, though it has nothing to do with marijuana. It plays to the same sensibilities, however: Juuling (yes, it’s a verb now) isn’t necessarily about a search for a high, but for an aura of cool. Every generation discovers — or appropriates — a vice and polishes it to the appropriate social sheen. Juuling upstaged smoking, and on it goes, the generations grasping for signifiers and identities separate from the adults. For the young, the Juul is this year’s incarnation of the fidget spinner. Instagram is filled with models such as Bella Hadid, who is a tender 21, claiming to smoke mango, and girls who simply post brief videos of themselves puffing on Juuls. There are memes — so, so many memes — about the panic that sets in when your Juul goes missing, and kids stuffing their mouths with Juuls and emitting one massive vaporous cloud. On YouTube, just one blurry video showing you how to smack Juul into “party mode” had more than 100,000 views. But Juuling, health professionals say, also carries the dangers of the death stick of the past. It is raising alarms by hooking youth on nicotine at a time when old-fashioned smoking has been hitting a steep decline. Boxes of Juul pods, which come in flavors such as mango, creme brulee and cucumber. For roughly $70, I take home a Juul and five “pods” — the nicotine equivalent of five packs of cigarettes. When I put it to my lips, it tastes faintly like an Andes mint and makes me feel deeply out of touch. Over the next month, I take Juul to bars and puff flagrantly in front of bartenders. They don’t stop me, but they glare. I hit Washington, D.C.’s trendiest, most aggressively hipster venues — like that new ax-throwing place — and don’t encounter a single other Juul. One night, I dig to the bottom of my purse and toss the device onto a patio table, triggering a flicker of colored lights — white, lavender, pink, blue, green. (Party mode, apparently.) A friend takes a drag of his Marlboro 27 and grimaces. The secret to Juul’s controversial success may be a twist on the age-old story of smoking as an outlet for teenage rebellion. The popularity of Juul seems to grow in tandem with the uproar: Sales of Juul are up more than 700 percent from a year ago, according to Nielsen data. Schools across the country say they are confiscating fistfuls of the things from their underage charges. Three lawsuits were recently filed against Juul Labs; each argues that users as young as 14 became addicted to Juul, and that the product was marketed as safe. 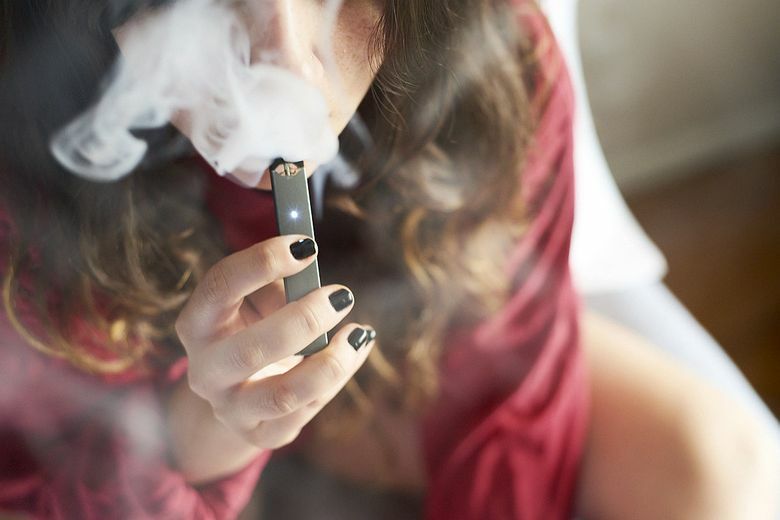 And last month on Capitol Hill, the American Association for Cancer Research convened a briefing on e-cigarettes’ exploding popularity with youth; the conversation revolved entirely around Juul. “I’ve heard lots of stories from kids who’ve used Juul in front of teachers, and they think it’s so funny that their antiquated teacher doesn’t realize that it’s, in fact, an addictive drug that they’re using,” says Benjamin Toll, chief of tobacco cessation and health behaviors at the Hollings Cancer Center of the Medical University of South Carolina, who was on the panel. The company, Gould says, is now working to “scrape” the Internet of social media posts of young people using Juul, and the unauthorized sellers who happily provide them. “No adult who has never used nicotine should ever use our product,” she added. That doesn’t quite jibe with the marketing: In one ad produced by the company, it’s a young woman in a bomber jacket and crop top — not a leather-skinned 45-year-old trying to shed his 30-year dependence on Marlboros — coolly blowing smoke. The Virginia Slims glamazon has come a long way, baby. American puffing peaked in 1970, when almost half of all adults smoked cigarettes. Smoking had been popularized by television and movies and celebrity. James Dean smoked. Marilyn Monroe smoked. When Jimi Hendrix picked at his upside-down Fender with his eyes closed, a lit cigarette invariably was dangling from his mouth. The feeling of subversiveness, the heady high of believing we were truly cool, helped lift the cigarettes to Americans’ lips; we kept doing it, despite the pervasive stink on our clothes and the tar that yellowed our teeth, because of nicotine, because it is addictive. Even the surgeon general’s landmark warning in the late 1960s that linked smoking to cancer couldn’t get Americans to quit. Instead, they gave it up at a glacial pace — by 2016 just 15.5 percent of adults smoked, according to the most recent CDC data, and it was largely thanks to a culture shift that cast the small circles of smokers who’d gather to puff outside of office buildings and bars as deeply uncool. They were addicts. It was around the same time that e-cigarette makers swooped in to woo smokers suddenly desperate to quit. They looked like cigarettes, with tips that lit up. They were unequivocally silly. Those proto e-cigarettes also never really caught on because they didn’t give users the instant smack of nicotine that one puff on a cigarette could. But Juul, introduced by vape company Pax in 2015 and spun off in 2017 as an independent San Francisco-based company called Juul Labs, was engineered to give you what smokers call “throat hit.” Which is to say, it smokes like a cigarette. It crackles like a fire. And Juul kept the nicotine and chucked out all the rest — the thin casing of paper that always seemed to fall apart in the bottom of our purses, the flakes of tobacco, the tar, the carbon dioxide, the smell, the very form of the cigarette. They just don’t believe that what they’re doing is smoking. To Allan Brandt, a historian and author of “The Cigarette Century,” Juul is anything but new and different. Overblown or a real threat? Could it be that with Juul, it’s just a different generation simply doing what young people have always done — testing boundaries, sneaking independence? Teen pregnancy is down, and marijuana is practically normalized. Perhaps Juul is just the new boogeyman to replace all the old ones. It’s almost as if it’s the cigarette industry come full circle, no? I think back on my own generation, which was in its teens when we watched Kurt Cobain on MTV, coolly dragging on a cigarette between strums of his acoustic guitar. And then, for a brief while, I smoked Parliaments on stoops in New York, too, till it became too expensive to continue. We straddled the time when all the fun kids loitered outside smoking, and the moment when, abruptly, the cigarette became social napalm. Perhaps that’s why, in the weeks that I toted around Juul, none of my friends, a group almost entirely in its 30s, seemed the least bit intrigued in the blinking thing in my palm. And I hated puffing on it. Too embarrassing. It sits in the bottom of my purse now, where only the obnoxious flash of party mode alerts me to the fact that it’s there, calling out not to me, but to the kids.